It's embarrassing to squeal on public transport, but that's what happens when I fall into an Instagram hole and come out the other side with the knowledge of a new brand. You'd think this fashion business was saturated with greatness by now, but no—the newness keeps on coming, and I can't help but fall in love. As someone who finds it difficult to find clothes that fit (being short and curvy means I have to shop more strategically), I'm always keen on uncovering new accessories to make some trusty old clothes zing. So that's why I'm letting you in on a little secret—well, eight, to be exact. Keep reading to see the hot-of-the-production-line accessory brands I'm into right now. Feel free to tell your fashionable friends about them—I don't need the credit. I do need those hair clips, however. Say the words "affordable designer handbags" and our entire team is there in a flash. 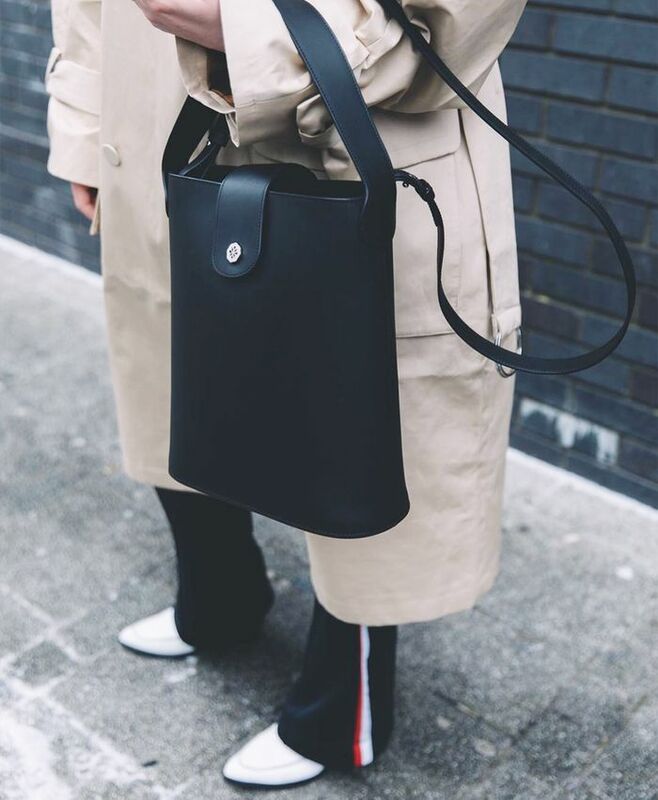 We first started to notice C.Nicol coming to the fore during February's fashion weeks, but now the British brand is picking up a major pace and being spotted on so many of the girls we love to follow (like Alexis of Style Memos pictured above). Accessible price tags, great quality, super-simple silhouettes that you'll never get bored of toting around… Count us in. It's hard to choose whether I like the opticals or the sunglasses more from the ultra-cool eyewear brand Grey Ant. What's great is that the brand produces limited quantities that are made to the highest spec in Japan and Italy. The label's silhouettes and finishes really aren't for the shy and retiring out there—hence the kind of celebrity fans (hi, Solange!) it's already gathering. There are few things Scandi girls (such as Hanna, pictured above) like more right now than old-school hairclips. Tracking these girls and their hair accessorising movements on Instagram has led me to a delightfully cheap Danish accessories label specialising in just the thing: Introducing Pico, my new obsession. Fancy flats were never my thing—until Korean footwear brand Yuul Yie came along. But when they're slingbacks with a slightly elevated heel and embellished with pearl and metal detailing… well, that's a very different story. If you like your earrings to be fun (with a capital F), then have I got the label for you. Mercedes Salazar is the Colombian jewellery designer who has your entire summer wardrobe wrapped up—literally with a cherry on top. Think jazzy banana leaf perspex danglers, mobile-like woven fruits (check out Amanda Norgaard's oranges above) and the most extreme tassels you ever did see. Sometimes the basics are hard to come by, but L.A.-based clothing and accessories label Donni has finally provided us with the kind of skinny, style-a-thousand-ways scarves we've been missing. Lucy Williams is a fan, doing her classic knotted ponytail move only recently. You can loop them around your neck and they'll be the perfect neckerchief length (we promise). Okay, so fans might not be the first things that come to mind when you think of accessories, but the old-school, super-glamorous items are genuinely making a comeback. You may have started to see these wafting around last summer, but expect to see a Fern Fans boom for holiday season 2018. The British brand, established by Daisy Hoppen and Amanda Borberg, has already been a real hit among industry insiders: Camille Charrière, Laura Jackson and Susie Bubble all keep their cool with the addition of a Fern. Now, I have to be honest with you here—I haven't yet ordered a pair of these heels (although the brand does ship internationally to 100 countries). But just look at them—they're resplendent in their slightly '90s stilettoes and rainbow of colours. Calling all UK boutiques: Please buy these in so I can stock up. There—now you're ahead of the fashion curve with your new knowledge of emerging accessories brands.